Can we talk cherries? I go a little bonkers for them every year. Last year, it was Cherry Lambic Crisps and White Chocolate-Cherry Ice Cream and Cherry Sorbet Sandwiches. The year before, I couldn't get enough of Pickled Cherries. So, when Whole Foods asked if I'd like to help celebrate Cherry Fest by coming in for more fresh, lovely cherries and planning a special menu around them, it was an invitation to a kid into the proverbial candy store. Cherry Fest is taking place at all Austin Whole Foods stores this weekend, Friday through Sunday, with special events from 12pm until 5pm. On Friday, there will be a one-day sale on cherries. 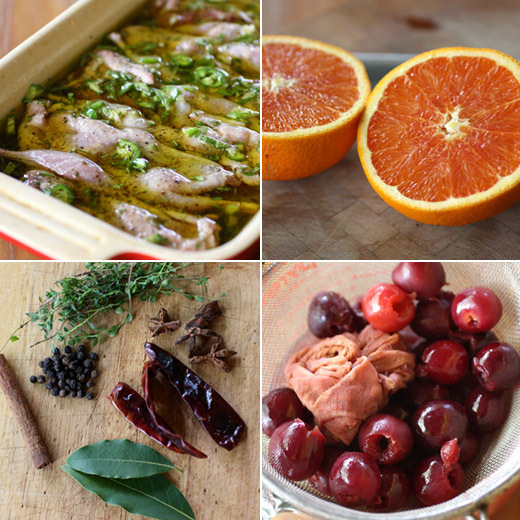 For a cherry-themed meal, I imagined quail would pair well with the fruit, and I set about hunting for sauce ideas. In Sunday Suppers at Lucques , there's a Savory Cherry Compote served with duck confit which I thought would work just as nicely with grilled quail. With the main dish decided, I started a search for a salad with cherries. Girl in the Kitchen had just what I'd hoped to find. 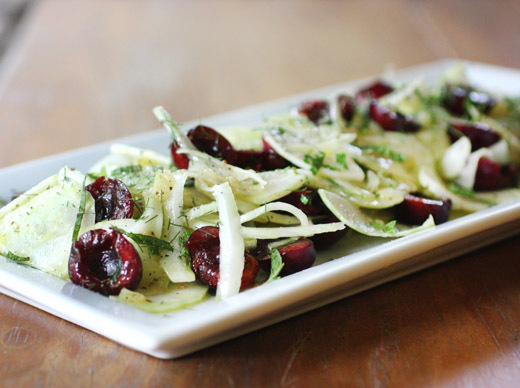 It's a raw, crunchy mix of thinly sliced kohlrabi and fennel with fresh cherries, and it's made tangy and bright with chopped preserved lemon and fresh mint. I couldn't help making a few minor changes to the cherry sauce. Rather than making it with port, I opted for a Zinfandel on the fruitier side. Also, to keep this sauce firmly in the savory category, I added some minced shallot to the ingredients that simmered with the cherries. So first, spices and herbs were gathered in a cheesecloth bundle, and those included thyme, bay leaves, chiles de arbol, star anise, a cinnamon stick, and black peppercorns. A quarter cup of sugar was melted in one cup of water in a saucepan, that was brought to a boil, and then a half cup of Zinfandel, juice from two oranges, and the spice sachet were added. I added minced shallot at that point as well. The heat was reduced to a simmer, and one third pound of stemmed and pitted cherries was added and poached for about ten minutes. At that point, the sauce was strained into a heat-proof measuring pitcher to remove the cherries and sachet. The strained sauce was returned to the saucepan, and cooked until reduced by two-thirds. It was strained again, seasoned with salt and pepper, and just before serving, a tablespoon of butter was swirled into the sauce and the cherries were returned to the pan. I used semi-boneless quail which were cut in half, and I removed the wing tips. I marinated the halved quail in a mix of olive oil, minced garlic, sliced serrano chiles, chopped sage, oregano, and rosemary. Grilling the quail happens quickly. They only need a few minutes on each side over high heat on the grill. Then, I moved them to a cooler spot on the grill and basted them with some of the sauce. The grilled quail was served with more sauce including the cherries. The sauce is full of big, fruity, spicy flavors, but once it coated the quail, it seemed more subtle, like that was exactly where it belonged. The salad is a very quick preparation. 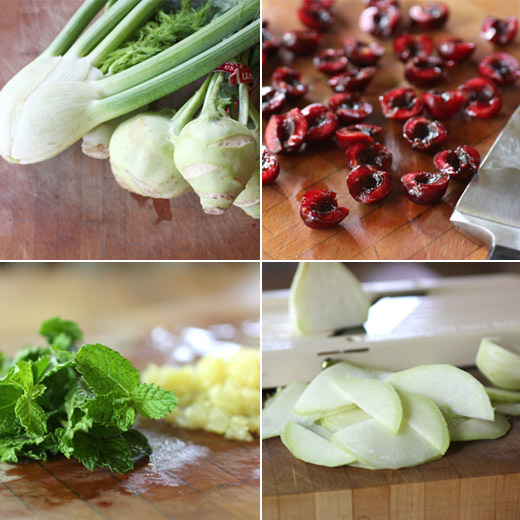 Trimmed kohlrabi and fennel bulbs were cut in half lengthwise, and then thinly sliced on a mandoline. Cherries were pitted and sliced in half. Everything was combined in a large bowl, drizzled with olive oil, finely chopped preserved lemon was added, and it was seasoned with salt and pepper. You should taste before adding salt since the lemon adds a good bit of saltiness of its own. After tossing to mix well, chopped, fresh mint was sprinkled on top. It's a simple mix of well-coordinated flavors. Fruity sweetness, acidity, herbiness, and the floral anise of fennel were delightful in this cool, crisp salad. I received a $150 gift card from Whole Foods. I am a member of the Amazon Affiliate Program. Woderful food! The quails must taste just divine and that salad looks really refined. Gosh, I haven't had quail in years. And they're so tasty. The sauce sounds like it's just excellent with them. Really nice dish - thank you. That's a lovely meal. I have often put orange slices with fennel in a salad (very Sicilian) but never thought about other fruit. I will definitely be trying some over the summer. What a lovely meal. I think the salad is my favorite part. It looks so refreshing and quite delicious. Like how you prepared the quail and paired with such a tasty salad with cherries...very summery. Absolutely fantastic Lisa. Wonderfully inspired recipe. 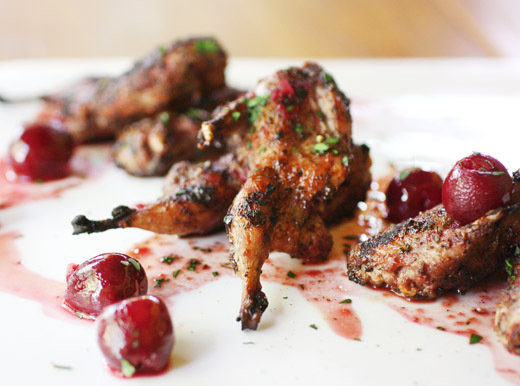 Love the matching of quail with cherries. Bet it tasted delicious! This is an amazing menu to highlight seasonal cherries. FUN FUN FUN! I'm working with Whole Foods to celebrate cherry fest also and it's been so much fun reading about your recipe choices! It's also made my stomach growl. Profusely. I have never eaten quail before but it looks delicious. I still remember those pickled cherries I made from your blog and how delicious they were. Gorgeous! Both recipe and the photos! wow, this is such a gorgeous meal! great blend of flavors! Lisa love this and the photos look wonderful!! I've never thought to grill quail. I've always deep fried them so this is a technique that I will deploy next. Your poached cherries in spiced wine sounds marvelous as does the crunchy salad. i've never eaten quail, and i don't expect to do so any time soon, but both the compote and salad are delightful! I had every intention of getting down to the store yesterday to pick up cherries but time got away from me. My problem is that I love cherries so much, it's hard for me to save them for a dish or dessert. I just want to eat them! As usual, everything looks and sounds delicious! I like the substitution of Zin for the Port- I don't drink it much because it's generally too much of a fruit bomb for my palate but Ill bet it worked really nicely in the dish. Delicious! Love cherries too, passionately, especially paired with meats. Alas, the season is almost over here. What a beautiful elegant meal. I want to pickle cherries before the season is over. I think that kohlrabi, fennel, cherry salad looks and sounds outstanding. I wish I could find a place that sells quail. Growing up in the middle of Kansas in a family of hunters, we always had it. The name sounds like something you would find in an extremely fancy restaurant.